A new study, published in Nature, reveals the molecular mechanism behind the fight of "good" bacteria against pathogens — a potential alternative to antibiotics. By Maria Arvaniti Staph infections are caused by bacteria of the Staphylococcus type. These bacteria might be on you right now, but its only when the protective barrier of your skin is broken – such as in a small cut – that they become dangerous. Nevertheless, staph infections are relatively easy to treat, and your doctor is most likely to suggest antibiotics. That is, unless the bacterial strain is the dangerous super-bug MRSA (Methicillin-resistant Staphylococcus aureus), a highly contagious and antibiotic-resistant staph type. Instead of antibiotics now, probiotics might be the solution to keep any staph infection away. Many “good” bacteria that are given as probiotics live on our skin or in our guts, and are thought to prevent the growth of pathogenic bacteria. Many “good” bacteria that are given as probiotics live on our skin and in our guts, and are thought to prevent the growth of pathogenic bacteria. But probiotics have been harshly criticized, largely due to lack of substantial evidence on how they work. 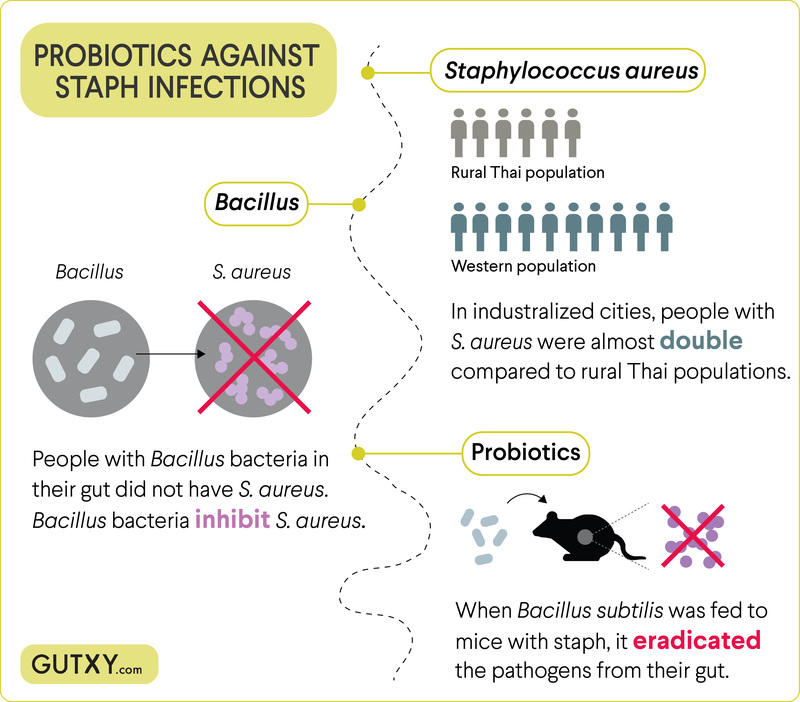 A new study, just published in Nature, adds more depth, showing that probiotic bacteria of the Bacillus type can actually eliminate staph infections1. Even further, the researchers identified the specific compounds responsible. So, does this mean that antibiotics could be replaced by less harmful and more natural products? In their study, Dr. Piewngam from National Institutes of Health (NIH), USA, and his colleagues looked into the gut microbiota of rural populations of Thailand. They found that, compared to the average “western” gut microbiome, the presence of Staphylococcus aureus (a dangerous strain of staph) was significantly lower. Only 12.5% of them had S. aureus in their gut, while up to 20% of people living in urbanized areas are commonly carrying the pathogen. The scientists thought that their gut bacteria composition could explain this difference. However, the overall composition between S. aureus carriers and non-carriers was the same. Strikingly though, every person that had any type of Bacillus bacteria in their gut – which was 50.5% of all people tested – also did not have S. aureus. That means that bacillus bacteria can prevent pathogenic staph from growing in peoples’ guts. But how? Strikingly though, every person that had any type of Bacillus bacteria in their gut – which was 50.5% of all people tested – also did not have S. aureus. To understand that, you should probably hear a bit about “quorum-sensing”. That’s a way for bacteria to sense the size of their population and take action in order to either multiply or stop growing. The researchers found that Bacillus bacteria produce certain substances, called fengycins, which are detected by staph bacteria and tell them to stop growing! Fascinating, isn’t it? The team, then, fed mice that had staph infections with Bacillus subtilis and saw that it completely eradicated the pathogenic bacteria from their gut. They further found that these substances work also against other staph strains, like S. epidermis. That means that these compounds can potentially be used against many different pathogens. So, these bacteria types could alternatively be used against serious and antibiotic-resistant staph infections. Reducing the use of antibiotics, in any case, is the best you can do for you, as well as for the vivid community of microbes living in your gut. Piewngam, P. et al. Pathogen elimination by probiotic Bacillus via signalling interference. Nature 256, 532–537 (2018). Mohammedsaeed, W., McBain, A. J., Cruickshank, S. M. & O’Neill, C. A. Lactobacillus rhamnosus GG inhibits the toxic effects of Staphylococcus aureus on epidermal keratinocytes. Appl. Environ. Microbiol. 80, 5773–81 (2014). Johansson, M. A. et al. Probiotic Lactobacilli Modulate Staphylococcus aureus-Induced Activation of Conventional and Unconventional T cells and NK Cells. Front. Immunol. 7, 273 (2016). Sikorska, H. & Smoragiewicz, W. Role of probiotics in the prevention and treatment of meticillin-resistant Staphylococcus aureus infections. Int. J. Antimicrob. Agents 42, 475–481 (2013).